The Scots travellers have been the single strongest community carrying traditional songs in Britain over the last century. Amongst them have been many of our major traditional singers. Jane Turriff was in the front rank amongst the very finest. She was born to Donald and Christina Stewart - Donald a fiddle player and Teeny a piper and singer. Her uncle was the great Davie Stewart and her maternal grandmother was an Irish traveller who brought another dimension and extension to the family's song repertoire. Jane became part of this great heritage and even as a girl was recognised as an outstanding singer in an extended family and community that had great number of such talents. She also took to instruments like many of her family and she played piano, accordion and, her greatest love, the harmonium (or was it an American organ?). She had a huge, highly decorated one of these and it dominated the bedroom of the tiny cottage where she lived in Gaval Street, Fetterangus. Like her uncle Davie, she had her own ideas on harmony that did not always fit with conventional musical theory, but had a way of fitting the songs in the way that she attacked them. 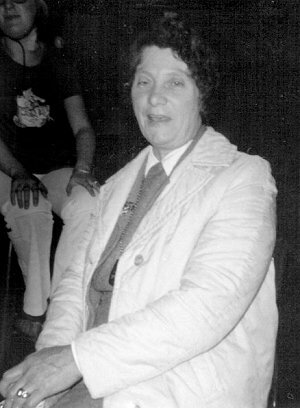 Jane was first recorded at her home in Fetterangus in 1955 by Hamish Henderson and these established her name amongst ethnomusicologists as one of the greats. Soon after the foundation of The Traditional Music and Song Association of Scotland in 1966, the wonderful festivals in Blairgowrie and then Kinross began and Jane and her husband Cameron Turriff were regular invited guests and a generation of young enthusiasts was able to meet and enjoy all the finest that the Scots tradition had to offer. Many contacts were made and after the 1973 festival, Tina and I were invited up to spend a week with them in Fetterangus - and what a memorable week that was! Space being what it was, we put up our tent in the space behind their house. The Turriff household could have been a rather lonely isolated place - for Jane was disabled and could only move on crutches and her husband was blind - but no, it was a happy, lively place mainly because of Jane's effervescent, bubbly personality and the fact that the house was full of music. There were plenty of visitors during the time that we were there and every visit was an occasion for more songs. We spent some of the week recording their songs and music on a portable cassette recorder and at other times they were recording us on their old Grundig reel-to-reel machine. Listening to the nearly 50 items that we recorded from them before writing this, I find Mill o'Tiftie's Annie, Laird o'Drum, Dowie Dens o'Yarrow but also Danny Boy, Will The Angels Play Their Harps For Me and A Mother's Love's A Blessing. Like so many traditional singers, Jane learned songs that just took her fancy. Clearly, she realised the importance of the 'Auld Sangs' as she called them and was always very animated and affected by them. However she said that her favourite singer was Jimmy Rodgers; we never heard any of his songs from her during that week, that had to wait until the following year's Kinross Festival. It was a late, late night session in the hall at the Kirklands Hotel. Most of the entertainment was coming from the trio of Tom Anderson, Aly Bain and Peerie Willie Johnson. They were playing Willie's jazz repertoire rather than their Shetland tunes. Singers were being asked up to sing a song each and then it was Jane's turn. Her yodelling cowboy song accompanied by the Shetlanders brought the house down. Of course, there had to be an encore but that was not enough once Jane had got the bit between her teeth. She sang quite a number of the Rodgers' repertoire that night. Although, she was hugely popular at the TMSA festivals, I don't suppose that she sang at many folk clubs. She did sing as a guest at our club in Lewes, however. This came about not that long after Cameron's death. Her great friend, Allan Palmer, had invited her down for a break, a bit of a holiday, to his house in Surrey. He contacted us and asked if we would like to meet her again when she was down and it ended up with us offering a club booking. Allan brought her to our house first and she spotted our harmonium. Well, that rather killed things as far as conversation was concerned, but it was a joy to hear her sing again. She gave us a great night at the club, but when I went to pay her, she was horrified. "Naw, naw, laddie! If they find oot aboot it they'll stop ma pension!" She was adamant; I ended up giving the money to Allan to give to her once she was convinced that no authorities would hear of it or if he couldn't do that, he was to use the money to buy something she needed when he drove her back home. Times have changed and we will never see the likes of Jane again, but many people who knew her will carry that pleasure and the privilege of knowing her for the rest of their lives.